Striking matcha "(pink)gold" in San Diego - Holy Matcha! One of the major downsides of traveling for me is not having access to good quality tea, let alone matcha. Never knowing what the “tea scene” will be at any given destination, I make certain to carry an ample supply of premium Japanese sencha and a strainer with me at all times. After all, how can one survive on a diet of teabag tea, right? That said, one of the most enjoyable parts of travel for me is the discovery of new teahouses. I love to see the myriad of ways people present and serve tea, the physical design and layout of the space, the beautiful teaware, and the array of menu of options and ways to infuse tea in food. To brace myself from disappointment, I never expect to find establishments that serve matcha, and remain ecstatic if I can simply find a place that carries quality loose leaf tea. Why put myself through such distress? That all changed last week when I traveled to San Diego for a behavioral medicine conference where I presented (twice - once about naturopathic medicine and the other on determining the appropriate mind-body medicine approach that works best for the individual - the meditation portion of this blog). In preparation, I did my research and read about the newly opened store focused not on loose leaf tea, but…yes…MATCHA!!! I couldn’t wait to try it out. And try it out I did. Luckily, my colleague, Cyndi, a current resident of San Diego with whom I presented willingly indulged my obsession and drove us to the North Park neighborhood to Holy Matcha, and as we parked and faced the storefront, we were greeted by a splash of bright pink. Happily, I am a fan of millennial pink (yes, that is a thing. My friend shared this NewYorkTimes article about it), since you cannot escape the color. From the wall tiles, to the matcha bowls, to the plates, to the menus, to the roses on the table - all is pink. Against a contrast of vibrant floral wall paper, I get a very South Beach/Art Deco vibe. And yes, I love the pink chawan (although I forgot to purchase one when there). The deep rich green of the matcha filling the pink bowl takes me back to one of my favorite preppie color schemes of the 80s. Matcha donuts - they were all gone a day later! We wanted to sample everything on the menu, and of the course of two visits, we did. I started at the top - their highest quality ceremonial matcha, whisked to a full bodied froth and presented in one of those bright pink chawan. While I tend to be personally a bit heavier handed with my matcha scoops, this was delicious - the right flavor combination, not bitter, with a lovely umami. Within the next couple of hours, we consumes matcha lattes with almond milk, gluten free matcha donuts (not very paleo of me, but I had to! ), matcha chia seed pudding with coconut milk, almond milk yogurt with berries and matcha, and finally a special of the week - matcha flavored horchata. All gluten and dairy free, and all amazing. I would have liked more of a pronounced matcha flavor in the yogurt, but still it was delicious. Returning the next day we tried their premium grade matcha (less expensive price point than the ceremonial, and yet equally lovely), followed by their matcha lemonade. This was the only item with which I was less than thrilled. The flavors were a bit off to me, and I found myself comparing it to some very lovely matcha lemonade I had here in Seattle at Remedy Tea. However, I loved everything else, particularly appreciative of being able to find a place that serves quality matcha in a chawan whisked by hand with a real bamboo chasen. Heaven! Atop several of the food items, you would find powdered matcha words, such as Holy or Matcha!, which were poured through a stencil. I love this finishing touch (probably because I got to consume some straight matcha powder off my plate or mix it in with my yogurt). Gluten free- dairy free matcha donut - paleo and keto diets be damned! The first day we showed up around a 3 PM on a Thursday afternoon and the entire space was packed with groups of people. This was not a place at this time of single customers sitting alone working or consuming matcha. I couldn’t get a sense of how many were locals or visitors, who, like myself, read about this interesting new place. I also wonder how many were there specifically for matcha. Most were on their phones, taking selfies or snapping images of the matcha, food, wallpaper or neon sign. I began to worry that this might be seen as the new hip destination spot from which to add posts to your Instagram account, overlooking the quality of the matcha and food. During our first visit, one particular group of 4 young women all sitting around the same table didn’t speak or look at one another for more than 15 - 20 minutes (yes I was observing this phenomenon), all with their faces glued to the screens. Of course they were not the only group displaying this behavior. The next day we returned around the same time and it was a bit more mellow, yet almost every seat was taken. 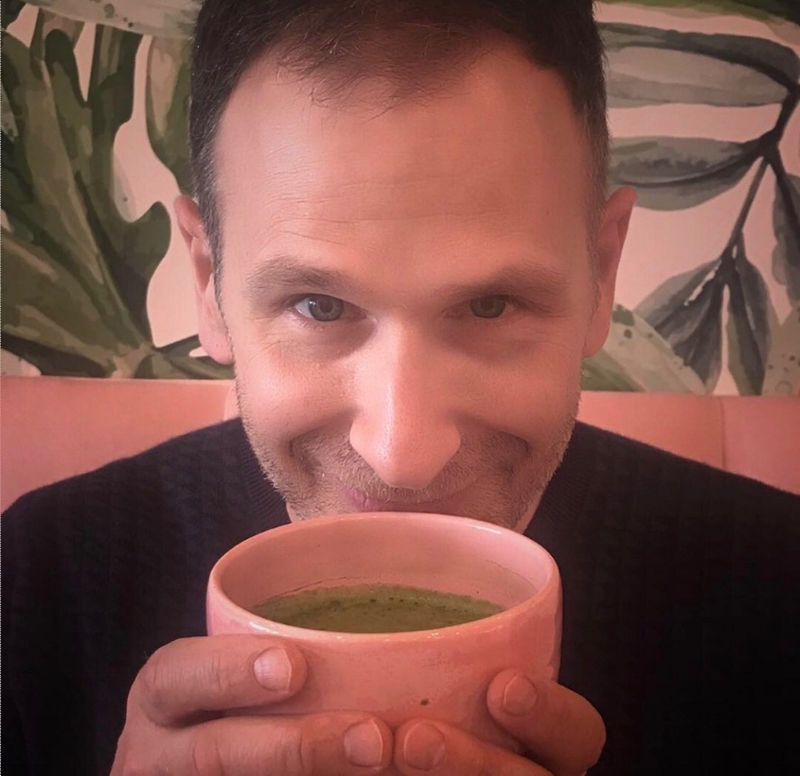 Now before you call me a hypocrite, let me state my case: I was there truly for the matcha, and to share my love of matcha with my friend (and the world). The entire visit was an experience. With each photo taken, Cyndi and I would review them, discuss them and hence, engage with one another. After the moment of picture gathering had past, we put our phones away to direct our attention to the matcha, food and one another. Another added bonus was talking with owner and founder, Geraldine Ridaura. She was eager to share her inspiration for Holy Matcha, and her ideas about various items on the menu. She is sweet and helpful, but we may have actually bonded over our photos of our furry babies - our cats! Equally helpful, making us feel so welcomed and at home was Taylor. Despite running around, whisking up bowls of precious elixir, and severing all the customers, she made a point to repeatedly check in with us and solicit our opinions about each items we were tasting. Cyndi and I offered to be sample tasters for any new items they are considering adding to their menu (strong suggestion #1 - keep the matcha horchata). I’m available, and it would give me incentive to return to San Diego with more regularity! Thank you Holy Matcha for being my matcha haven in a southern Californian tea desert, and exposing more people to one of my loves - matcha. I appreciate the gluten and dairy free offerings to round out the experience. I will be back, if not just to purchase a pink chawan!